Enthusiastic and forever smiling, Bushra Khan is, unsurprisingly, our very first Student Spotlight. 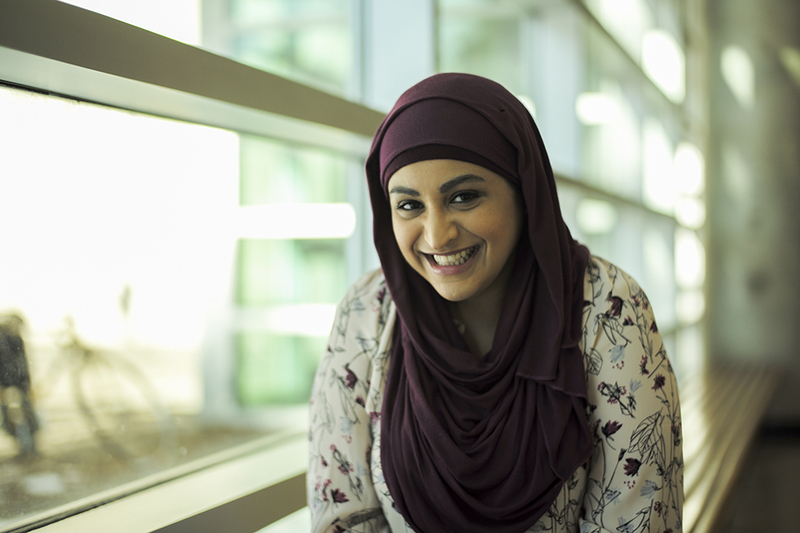 Bushra holds two undergraduate degrees in biomedical sciences (University of Ottawa) and in psychology (Carleton University). “Education has always been essential to Southeast Asian culture as a means to improve one’s life. I am especially blessed in that the educational opportunities available to me in Canada would be inconceivable for a young woman in Southeast Asia. I choose to live my life with purpose every single day. “As a young woman of a visible minority who has made the life choice to wear a hijab, I have worked hard to prevent a lack of understanding, privilege, or access to resources from hindering my drive and my ability to achieve future goals. Early in my life, I chose to reject the societal pressures placed on women. I chose to live a life where I would make a pointed impact in the life of the people I met, communities I lived in, and career I practiced. We must realize that rather than training for our future, our schooling is actually forming who we will be in the future. “Most people believe that the task of university and life is to train us for our future careers; however, the work environment changes much more quickly than academia ever will. Education actually serves a purpose greater than a perfect GPA, great references, and an outstanding CV; the value of a good education is to create an individual who thinks critically and behaves responsibly. We must realize that rather than training for our future, our schooling is actually forming who we will be in the future. We must take advantage of the opportunities at our disposal to learn about ourselves, take as many chances as possible, and learn to not be afraid of failure. “Rather than pursuing higher education immediately, I decided to showcase my skills and pursued employment. I worked at a cutting edge healthcare research firm that used big data to improve health care outcomes in certain fields. I continued for a few years and although my work was satisfying, I knew I could be doing more. I chose to pursue medicine because I realized how powerful a tool of social justice it could be. As a student deriving from a marginalized background, I have a unique perspective to advocate for the needs and conditions of this population. Medicine afforded me the best opportunity to improve the lives of those with whom I share a similar past and advocate on their behalf through legitimate credentials and experience. I aim to advocate for those who cannot be seen and cannot be heard. I am in awe of how open and comfortable patients are to discuss their problems and concerns with their doctor. Even as a medical student, the ability to have someone trust you so much to have them tell you their deepest and darkest secrets is so riveting and life-changing for me. “It takes a village to raise a child and a community to attain success. I’m the outcome of many, many, many people believing, investing and entrusting in my ability and my future. The most kudos is reserved for my parents, who put everything they had ever worked for on the line and moved away from everything they had ever known. My parents did all of this in order to bestow to their three young daughters, an opportunity that most girls in this world are stripped of, an education. Great Job ! That was something awsome to read..